We landed in Munich, to find that the guy who was going to pick us up had been there 4 hours earlier, due to miscommunication. Living in a world with cell phones and free airport wifi makes these problems relatively trivial, and we just decided to sit and wait unti Toby’s plane came in and we’d all go together. i was texting him while he changed planes in Heathrow, so everything fell into place. We collected the boy, found the driver who had been sent and drove off about an hour to Feldafing, a tiny burg where the coach trip would begin. Dinner in the hotel included a glass of Konig Ludvig Dunkel, a dark beer recommended by our coach driver–a man who knows his beer. The next morning I went for a short stroll around the village, noting the tiny town square where the coffee vendor was already set up and the fish and vegetable merchants were arriving. There is no pattern to its path–the mower just goes until it hits a bush or the end of the grass, backs up, turns a bit to one side and goes again. Some mathematician can undoubtedly figure out how long until it cuts the entire yard, I just watched in wonder. After the walk, time for breakfast. German hotels invariably have an excellent breakfast buffet included in the room rate. Although France has the reputation for great bread and pastries, I think the Germans are by far the better bakers. The variety and quality of the morning spread is breathtaking and mouthwatering. A car came to collect us and take us to the stables where we would start our journey.There are 7 others on the trip, and we drove perhaps 10 k to meet our guide and the horses. Our host, guide and drive is Andreas Nemitz, who had been doing this for 40 years. He drives around Bavaria in the summer, in Tusany in the spring, averaging over 6000 k per year hauling passengers. Andreas has a variety of coaches for different roads and groups. The coach we have holds three rows of 3 on the top, and seats 2 in moderate comfort inside–4 is conceivable but not comfortable. The wooden wheels are finished with iron “tires”. About this time a taxi pulled up with daughter Kate, who had just arrived in Munich that morning. Since everyone was on-site, we loaded up and headed out. Loading the coach with Andreas dressed and in his seat. This isn’t like the stage coach you see in the movies. It takes a driver and a groom to handle everything. Our groom is Malcolm, a friendly Scotsman who jumps down and and operates gates, gets recalcitrant horses back in line, sets the drag break and generally facilitates the trip. There is no galloping here. The pace is generally a gentle trot on the flats, a slower walk on the hills. We cover about 30 miles a day in 5 or 6 hours of driving. We are travelling on tiny one lane roads that connect the farms. In the American model, the farmer lived on his property, well separated from his neighbors. In Germany, the farmers live in small villages and go out to their fields every day. 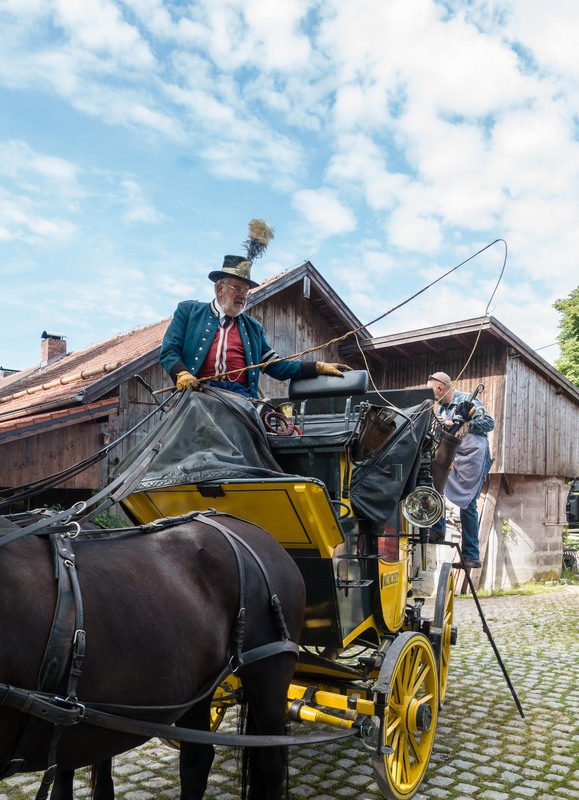 It is written into the constitution of Bavaria that these farming roads are open to all, and they are perfect for coach travel. You see many bicycles and motorcycle and just a few cars on them. The villages are like storybook pictures of what a village should be–every house is perfectly maintained, there is no litter anywhere, every home has a beautifully tended garden. Imagine travelling through rural A/merica for 3 days and never once seeing a broken car on blocks in somebody’s front yard.